Gunter De Backer is not a newcomer to the sport of sled dog racing in Belgium and internationally. He has competed since the 90’s having enjoyed success to a very high level with many wins and podium places. After having a break from the sport in 1997, he is now hungry for success once more. He says “It was always my dream and a goal to work with a great team in sled dog racing again, it gives you a very satisfied feeling when you are with your team racing through the snow and the only thing you hear is the breathing of the dogs and the only thing you see is snow/mountain tops and trees”. In 2013 Gunter and his team made the decision to step back into the sport and create their own team with high quality dogs they had bred themselves. Gunter is pleased with his breeding decisions, as they have built a strong base of good dogs. After a few years of building up their team and kennel they are now back on track to be a very successful sled dog team in both the 6 dog and 4 dog classes. Gunter approached us a few months ago to be part of the team of STORM advocates having used the product successfully previously. He said “thanks to the support of STORM Canis we can train our dogs in the best circumstances, building up their muscle strength and stamina, to provide them with the best base level of fitness and develop their strength and speed. We look forward to watching Gunter’s progress with his team of dogs through this season and wish him every success. 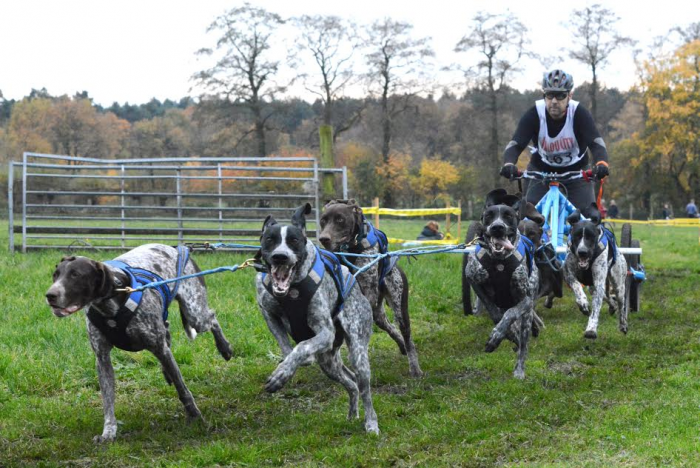 His early races have shown a very positive start to the season with 3 wins from 3 starts, including the German Dryland Sled dog racing championship. Well Done! !